Reversing these experimental policies initiates a new set of dynamics which will gradually reduce excessive liquidity from the financial system. Just as quantitative easing (QE) and zero interest rates were a grand experiment, the removal of these policy measures is equally experimental. Now, over 325 million domestic lab rats and the rest of the world wait to see how it plays out. Importantly, if the Fed continues down this path, investors should carefully consider potential risks and the appropriate market exposure in this brave new world. Despite the multitude of unanswerable questions about the implications of these events, what we know is that the economy is in the late stages of an economic expansion. Just as low tides follow high tides, we can use prior cycles as a guide to consider prudent, late-stage portfolio positioning. As discussed in, Everyone Hears the Fed but Few Listen, the difference between Fed officials’ expected path of Fed rate hikes and market expectations for the Fed Funds rate is important. The implications for the market and investors are especially compelling when considering asset allocation weightings. For example, if the Fed continues on their path of more rate hikes and surpasses market expectations, stocks are likely to struggle as much needed liquidity evaporates. The bond market, on the other hand, will probably continue to do what it has been doing, but to a greater extent. A flatter and possibly an inverted yield curve would be in order unless inflation rises by more than is currently expected. Conversely, if the Fed backs away from their current commitment, it will likely be bullish for risk assets and the yield curve would probably steepen, led by a decline in 2-year Treasury yields. Through September this year, the U.S. economy has posted an average growth rate of 3.3% (average quarterly annualized) and S&P 500 earnings have grown over 20% so far this year. The news from consumer and business surveys is favorable, and the country is essentially at full employment. That all sounds good, but is it sustainable? 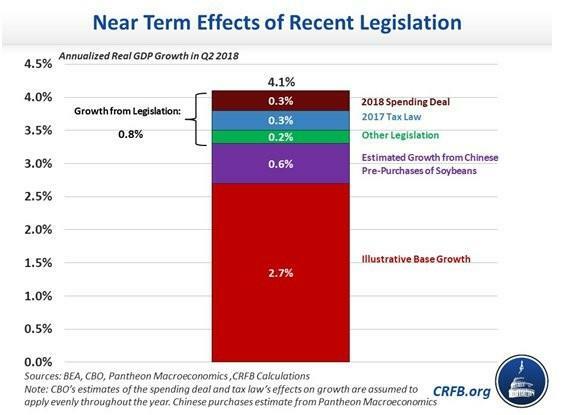 The table below, courtesy of the Committee for a Responsible Fiscal Budget (CRFB), shows that recent tax and budget legislation along with soybean purchases in anticipation of trade tariffs drove recent economic growth at the margin. 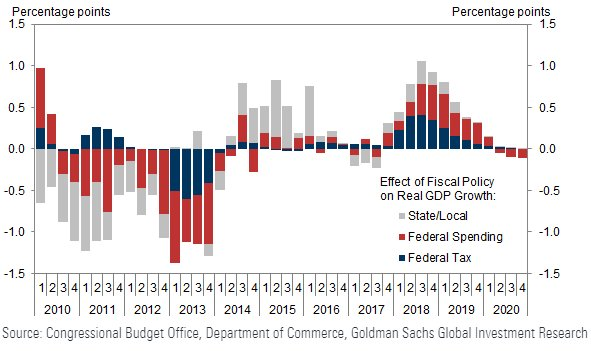 While the stimulative impact of fiscal policy remains favorable, it will steadily decline toward neutral for the rest of this year and throughout 2019. Policies regarding tariffs and trade are likely to weigh on economic growth throughout this year and next year. Most importantly, the Fed is clear that their plans are to continuing raising rates and reducing the holdings on their balance sheet that resulted from QE. Since the end of the recession in June 2009, the economy has clearly moved from recovery to expansion. That means the U.S. economy is nearing the “slowdown” phase of the cycle and heading toward the contraction (recession) phase. The evidence of the U.S. now being in a late-cycle environment is compelling and strongly suggests that investors modify their asset allocation weightings to protect against losses as the cycle progresses. The past does not provide investors with perfect information about how we should invest, but it does offer excellent clues. It may be helpful to look at the major asset classes and consider portfolio adjustments for late-cycle positioning. 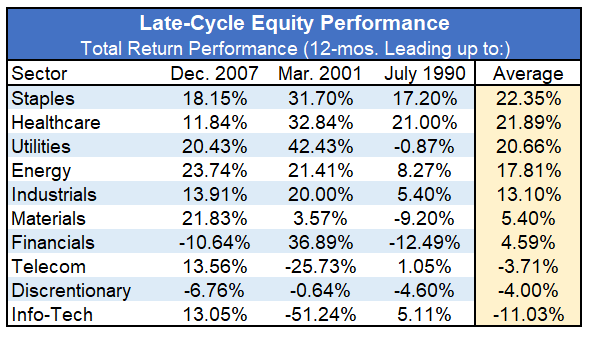 U.S. Stocks: To evaluate late-cycle performance, we looked at equity performance by sector in the 12-months leading up to each of the prior three recessions (1990, 2001, and 2007). Every environment is different, and what outperformed in the past may not on this occasion as the cycle unfolds. Prior to the last three recessions, investors preferred defensive sectors, such as staples, healthcare, utilities, energy and industrials during late-cycle periods. 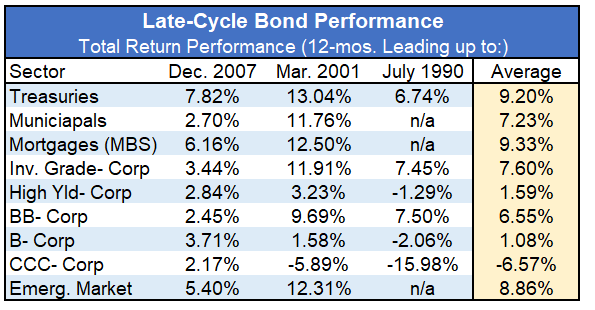 U.S. Bonds: Using the same framework, we looked at various bond categories in the period leading up to the three prior recessions (due to limited data, some categories do not have return information for the 1990 period). The important takeaway is that investors prefer lower risk bonds leading into a recession. This is also evident across the rating categories of the high yield bond market. Note how much better BB-rated bonds perform relative to lower-rated B and CCC bonds. The quality of the securities within both the investment grade and high yield market is so poor in this cycle (highly levered, high percentage of covenant-lite structures, high percentage of BBB-rated securities in the IG sector) that we urge a very conservative position in both cases. Indeed, the “up-in-quality” theme holds for any credit instrument in the late stages of the cycle. Commodities: Despite the rise in oil and gas prices in 2018, commodities remain the most undervalued of all major asset classes. Some soft and hard commodities have been hurt by the tariffs initiated by the Trump administration, but there is a reason they are characterized as “commodities.” We need them, and they are staples to our standard of living. Supply fluctuations will occur between nations as trade negotiations evolve, but the demand will remain intact. Additionally, global central bank interventionism remains alive and well as demonstrated by recent actions of the Peoples Bank of China (PBOC). To the extent that central bankers continue to take the easy route of solving problems by printing money to calm markets when disruptions occur, natural resources and agricultural products will likely do well as a store of value – much like gold. They all reside in the same zip code as a means of protecting wealth. Cash is King: In addition to the ideas illustrated above, it is always a good late-cycle idea to raise cash. As American financier and statesman, Bernard Baruch said, “I made my money selling too soon.” Although the low return on cash is a disincentive, the discipline affords opportunity and peace of mind. Having cash on hand is also a reflection of the discipline of selling into high prices, a skill at which most investors fail. Cash is an undervalued asset class heading into a recession because most investors panic as markets correct. Those with “dry powder” are better able to rationally assess market changes and more clearly see opportunities as certain assets fall out of favor and are cheap to acquire. Many investors elect to leave the “serious” decision-making to their investment advisors on the assumption that the advisor will make the right decision “on my behalf.” They delegate with full autonomy the task of adjusting risk posture, when the advisor ultimately bears far less risk in the equation. Being inquisitive, asking good questions and challenging the “hired help” is a proper prerogative. One should always operate and engage with humility but never on blind faith. Given the complexities and the risks of the current environment, investors should not be silent passengers on the journey. One who has wealth and takes that responsibility seriously should have valid questions that are both difficult to answer and enlightening to debate. Iron sharpens iron as the proverb says. The Fed has now taken eight steps in their path to normalizing interest rates and trying to set the economy on a sustainable growth path. Although he probably did not consider its application in the realm of monetary policy, Sir Isaac Newton’s law of inertia states that a body in motion will remain in motion unless acted upon by an outside force. Rate hikes are in motion and likely to remain so for the foreseeable future unless and until some outside force comes in to play (crisis). Given the extreme nature of past policy actions and the likely impact of their reversal, forecasting future events and market behavior promises to be more difficult than usual. Reliable guideposts of prior periods may or may not hold the same predictive power. Although unlikely to afford investors with prescriptive solutions this time around, there is value to doing that analytical homework and gaining awareness of those patterns. Finally, as the cycle unfolds, successfully navigating what is to come and preserving wealth will also require investors to apply sound decision-making using clear guidance and input from those who dare to be contrary.